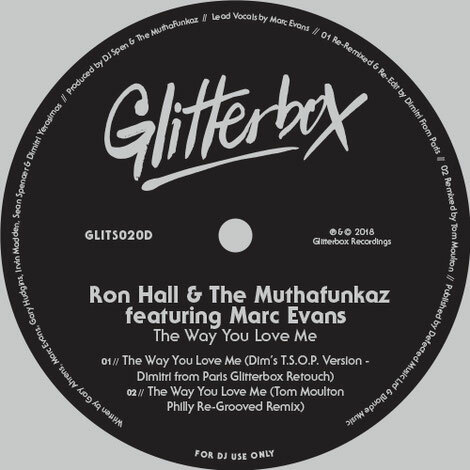 Glitterbox resident Dimitri From Paris and remixer Tom Moulton present their retouched mixes of Ron Hall & The Muthafunkaz modern day soul track ‘The Way You Love me’. Initially released in 2006, Marc Evans provides smooth vocals complimented by background harmonies and disco production. For his T.S.O.P. remix Dimitri From Paris enlisted the help of Salsoul Orchestra founder Vincent Montana, Jr. for fresh strings as well as a new full orchestra arrangement in his version, and here he gives it an update with his previously unreleased ‘Dim’s T.S.O.P. Version - Dimitri from Paris Glitterbox Retouch’. Tom Moulton’s retouched ‘Philly Re-Grooved Remix’, now available digitally for the very first time, comes laden with guitar riffs, dreamy harps and xylophone. Two disco artists come together under one soulful Glitterbox release leasing new life into this top record.